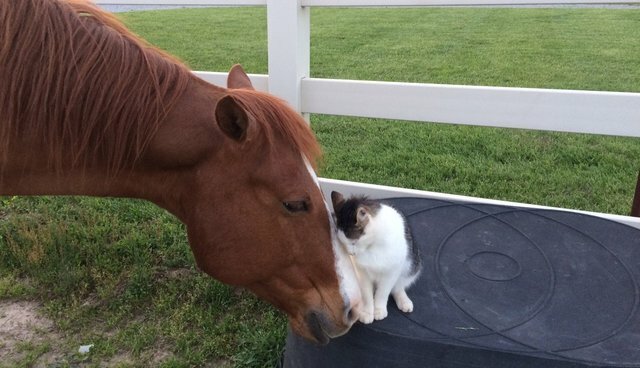 Sappy the cat and Dakota the horse are inseparable. Their friendship started when Sappy was only a kitten, and even as a tiny little guy, he was never afraid of Dakota. "As the little fella started to grow I noticed he would be laying next to the horse as he grazed," Denice Kinney, the pair's mom, told The Dodo. "If the horse laid down, he would lay on him. I've even seen him crawl up his tail to get on his back!" Dakota is super gentle with Sappy, and the pair love to snuggle. You might think these two wouldn't have much in common, but despite everything (including the HUGE size difference), they adore hanging out together and are rarely apart. "The cat is in his stall every day during feeding time and after feed time," Kinney said. "I always set down the container and they both come. 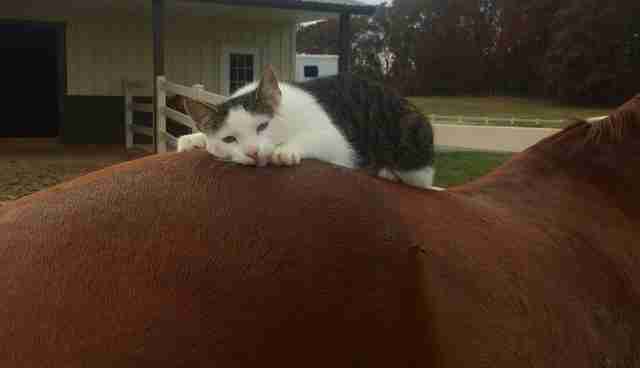 If I go riding the cat goes along like a dog would!" Dakota acts almost like a fatherly figure to Sappy. What these two have is truly unique, and it seems like they'll be together for years and years to come. 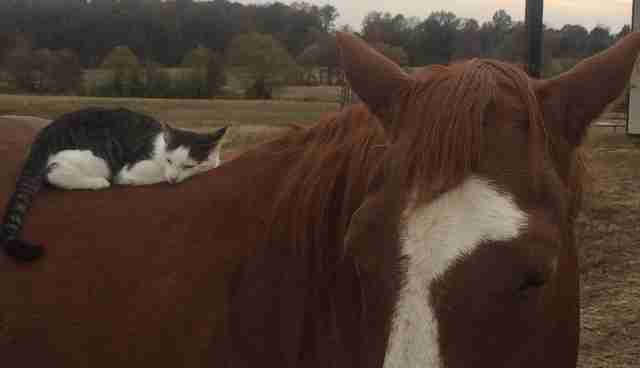 "A horse person will realize that the horse could easily have already harmed the cat but he is gentle even when he gets ahold of the nap of his neck," Kinney said. "They are quite the pair. They truly have a special bond."